Code highlighting: server or client? Do you think syntax highlighting (in blog posts, examples, etc) be in client side or server side? For the first half of the day the poll ran, client side held 2/3rds of the votes. It ended with a 60:40 split between client and server. Though (without giving it too much thought) favour client side (I'll come on to my reasons in a bit), I was surprised at the results being around 2/3rds preferring client side. So I decided to look at my own blog posts to see what would suit my system best. There's no TL;DR for this post because I suspect if you're reading this blog post you already know the answer that fits about 95% of the time. My aim for this post was to dispel any misconceptions I might have had. The context for this post is my own blog, a fully static site (specifically: the visitor won't enter code themselves). Let's skip straight to the proof in the pudding shall we? I released two branches to my Netlify deployed blog, one with client side rendering (as it stands as of 7 April 2019) and one with server rendered syntax highlighting. The order of the screenshots will always be client side then server side. Finish times and load times are about the same. DOMContentLoaded is delayed by around 100ms on the client rendered side, this I would expect to put down to Prism running client side - but we'll find out for sure next. I ran these two performance tests with the network slowed to "Fast 3G" and throttled the CPU to 4x slowdown (only to help amplify the effects I was looking for). As expected, SSR wins out and there's nothing unexpected. 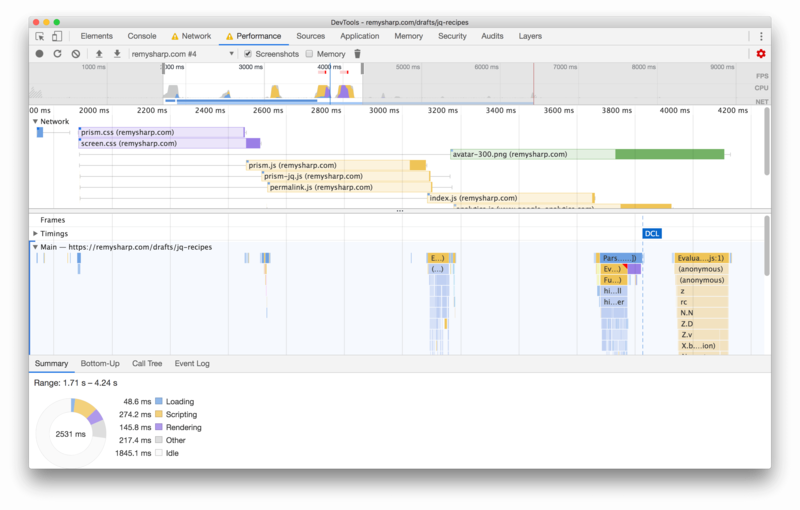 Importantly the HTML parsing time only was 8.31ms - again this post has a lot of code examples, but I'd argue this was negligible and browsers are doing what browsers do best. Without the SSR of the code highlight, the parse time is 4.91ms. That's to say: there is practically zero impact on parsing time even though we know the parsed HTML is twice the size when SSR is in play. What about a mobile device though? The above tests were run on my desktop and additional HTML doesn't seem to be much trouble for a fast laptop. I ran a pared down test on my mobile device (albeit a Pixel 3XL which is one of the more powerful mobile devices, but it was a start). 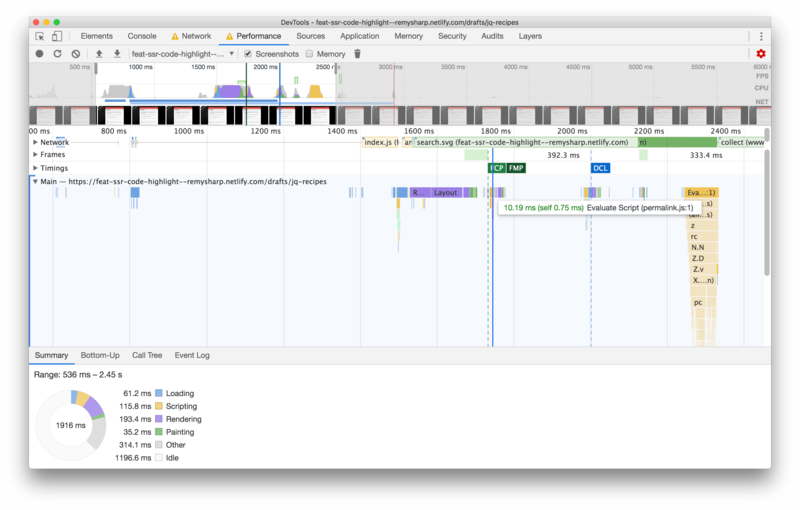 For this test, I stripped out all external assets so the performance was able to focus entirely on the HTML parsing time. The bottom line: no impact what so ever. Going by these results, it's hard to argue at all in favour for client side syntax highlighting. So why are so many people, myself included, reaching for client side as a default? Obviously I can't speak for others, but I can share what I've experienced. Well over a decade ago (yes, I've been coding longer for the web) there wasn't an readily available option for SSR code highlighting. For blogging you either had hosted options like blogger.com and wordpress.com or you would host your own. I used WordPress on my own dedicated server. WordPress had a lot of server processing to do just to render the HTML for a blog post, so the idea and cost of adding syntax highlighting was unappealing. In my case, my new blogging software borrows ideas from 11ty and uses markdown-it-prism. In reality it's really not much more than a couple of lines added to your server side software to support syntax highlighting. Syntax highlighters use lexers and parse text input into tokens and spit out markup. It doesn't need the DOM for this particular task. However there may be highlighter plugins that you use that do require the DOM and this won't fly on the server side. Run the highlighter on both the server and the client. A terrible idea and a waste. Drop the plugin entirely (and somehow rework the code examples that relied on it). Run the highlighter on client side so I can use the "keep-markup" plugin. In the end, for my own site, I weighed up between client side code highlighting and removing the plugin: I decided to remove the plugin. I'm equally guilty of running to npm to find a library that does a task that will be easier to install than code myself. Obviously there's good justification for that, but I should really audit the decision properly and thoroughly. This particular topic, that of the "easiest choice" for the developer is a much bigger discussion, but I can see how this seemingly benign decision between client or SSR highlighter feeds into developer convenience. As I suspected, I was holding onto a (very) old assumption about server support for syntax highlighting that had stuck with me for well over a decade and lead me to the wrong approach. Server side rendered syntax highlighting is extremely capable these days and the question of client side impact is quite literally zero. I'm quite amazed at the poll results, and I wonder if my wording in the tweet may have swayed the results, but also I suspect there's a general tendency to reach for the quick and easy answer. The truth is that SSR code highlighting really isn't hard at all, and only required one additional step. Posted 9-Apr 2019 under code.